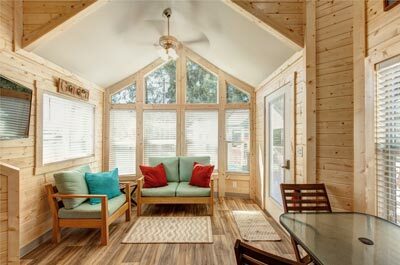 Enjoy all the comforts of home inside your custom-built 385-square-foot tiny home. With three queen-sized beds, a completely-stocked kitchen with full-sized appliances, your own WiFi network and a smart DVD player, you won’t be lacking for anything during your stay with us. 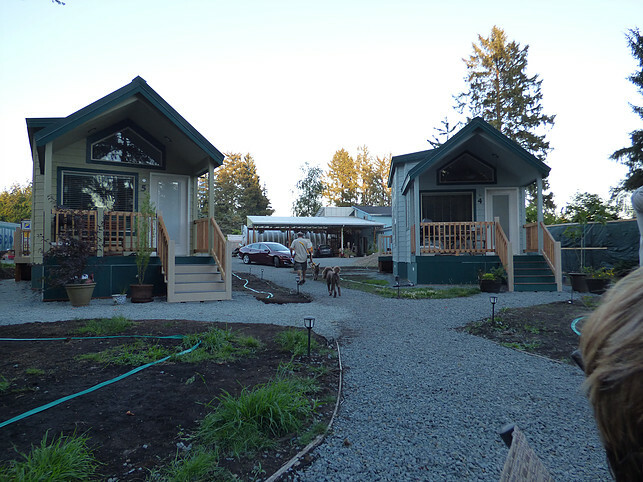 Each tiny home boasts the same designer layout with a different theme. Themes include The Gardener, Beach Comber, The Birder, Mermaids, Gone Fishin’ and a sixth cabin that will be wheel chair friendly. If you might need anything else, Dee is always happy to make a run to the store and make sure her guest’s tiny homes are stocked ahead of time with anything they like – just let her know when you’re making your reservation. Sheltered Nook is home to the only disc golf course between Newport and Astoria. A well-groomed field surrounded by trees creates the perfect space where disc golfers can enjoy their favorite sport. Day travelers are welcome to come play and game, and there is no charge to use the field. It’s just one more activity that owners Dee and Hank wanted to offer their community.